Have you ever wondered who decides which books to purchase for our clinics? 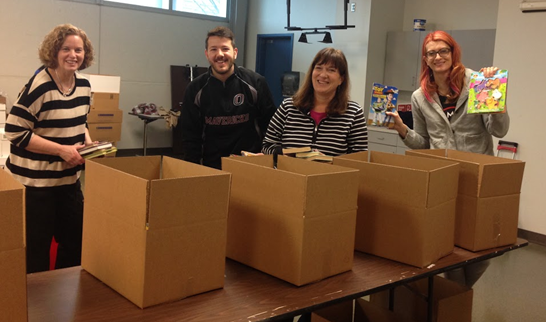 Or who organizes our book drives and deliveries? 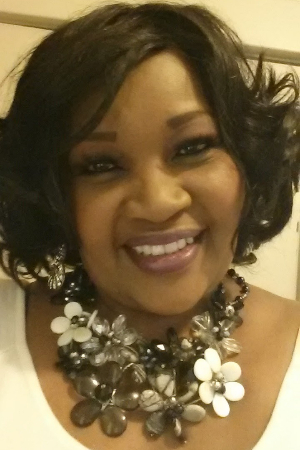 Meet Janice, our book coordinator of over 15 years. She’s responsible for purchasing, organizing, and managing the delivery of over 83,000 books to our 51 partner clinics. 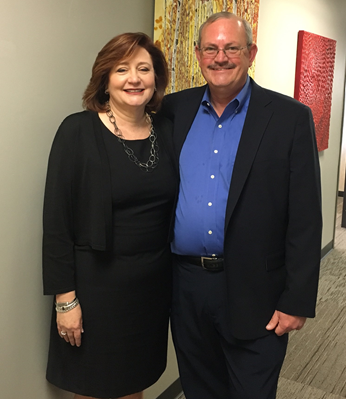 Recently, Janice joined us to talk about her important role as RORKC’S book coordinator. How did you first get involved with RORKC? My family moved to Kansas City in 1997 and one of my sons became friends with the son of Laura Gregory, the chair of the Community Council at the time. She mentioned that she was involved with this organization and asked if I would have any interest in serving on the Community Council. 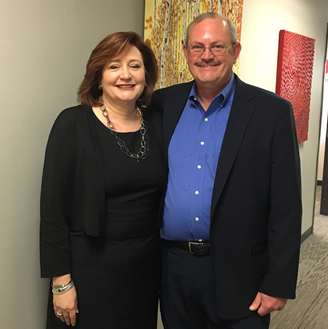 After joining the council, I was offered a 10 hour a week position helping Jean Harty, co-founder and medical director, as a book coordinator. Gradually, the time commitment increased to the position as is it is now. How do know which books to purchase for our clinics? There are a number of different things that help me decide which books to purchase for our clinics. While I have a degree in early education and special education, I believe that my better qualifications for this job are that I have kids and grandkids. I’ve seen them grow up with books, so I have an idea of what they read and enjoyed. In addition to my knowledge, I do spend time reading the research and book reviews on what is best for the different age groups. 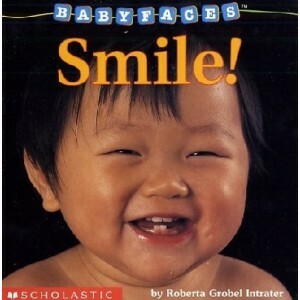 For example, we know that children around the age of 6-12 months love to see other babies faces in their books. 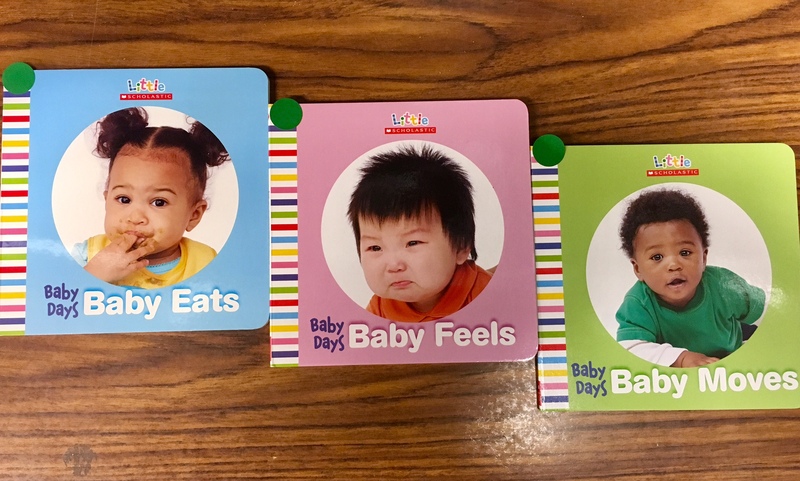 So for our 6-12 month-old books, we focus on purchasing books like the “Baby Days” series, that are full of cute and engaging faces. so I try to stay away from those books. This may be one of the only books the family has, so we need to give them something durable and long lasting. It’s also important that we focus on purchasing books in multiple languages and that feature diverse characters. We know the families and their kids need to see themselves represented in what they are reading. Medical providers also weigh in on which books we provide. I ask them how the books are received in the clinics, and their opinions on the books. They are the ones who are directly providing the books and get to see how the families respond, so we love hearing their input. Ultimately we just want to give the children and their families good books. 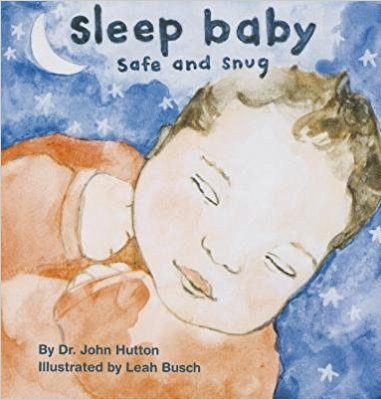 It’s certainly all of the classics like Good Night Moon, or books that have received critical praise like the Caldecott Award, but really it’s a book that the families will read with their children. A book is a good book if the family shares it with their child and if the child pulls it off the shelf to read with mom and dad. 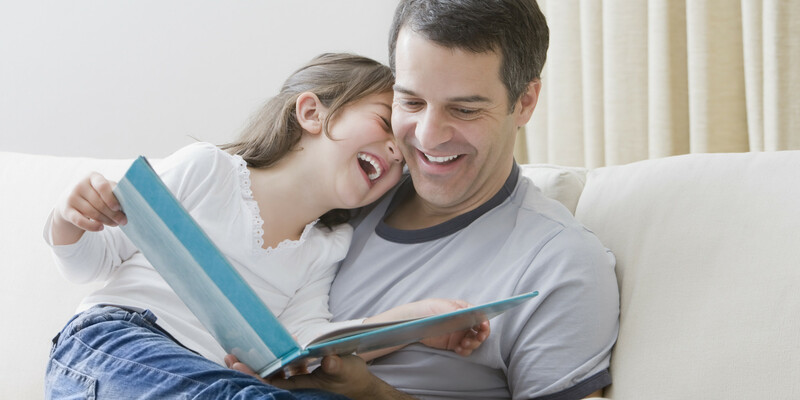 A good book is one that engages the family and encourages them to read aloud together. 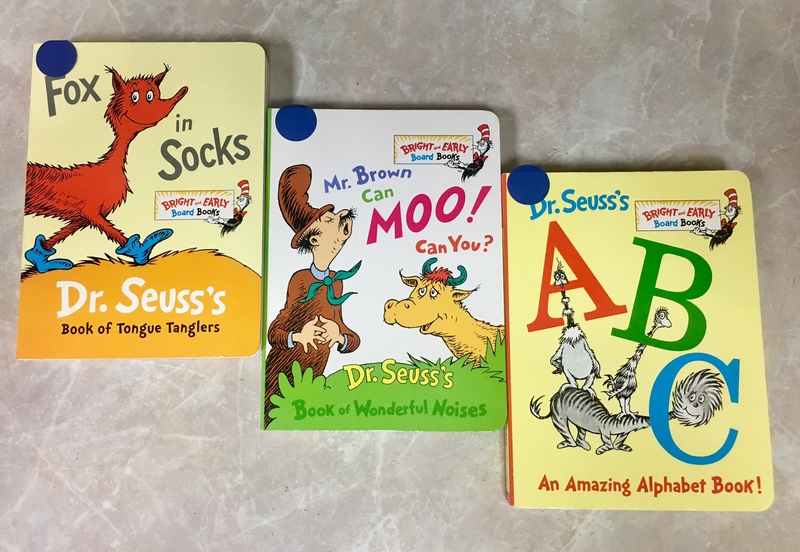 I love the classics, like Brown Bear Brown Bear, Chicka Chicka Boom Boom, and all of Sandra Boynton’s books, but I also really like the smaller Dr. Seuss board books that we provide. They are a little less cumbersome than the regular Dr. Seuss books, but they are still full of rhyming and are very sturdy. What is the best part of being our Book Coordinator? I think it’s knowing how many families we are reaching. I love the organizational aspect of it and managing these types of tasks, but in the end, it’s that all of these Kansas City families are receiving books and literacy advice. 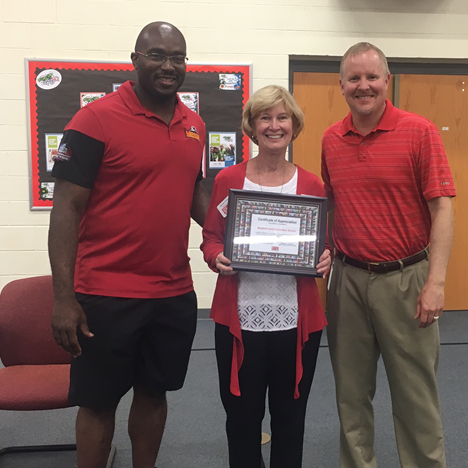 Thank you Janice for all that you do for Reach Out and Read Kansas City! As Anthony Meyer’s three sons grew older, he realized that other people, besides himself and his wife, had an influence on their lives. He saw that coaches, teachers, and others were positively impacting them and decided that he wanted to volunteer to have a similar influence on others. This led Anthony Meyer to Reach Out & Read Kansas City. 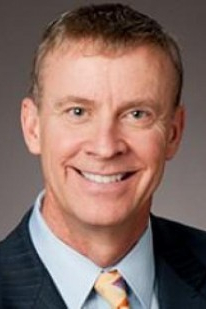 Because he worked near Children’s Mercy Hospital, he reached out to them to see how he could be involved. They recommended that he become a volunteer reader in their Pediatric Care Clinic as part of the Reach Out and Read KC program. He began reading to kids during his lunch hour and still does weekly. Meyer has read for almost 14 years and served on our Community Council for 7 years. His dedication and passion are what help make our program succeed. When I joined him for lunch, he brought along The Cat in the Hat. 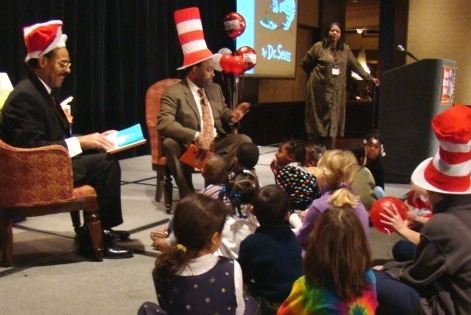 He began by stating that he loved The Cat in the Hat because it is a fun and engaging story. Then he demonstrated his favorite part were Thing One and Thing Two enter and the cat asks, “Would you like to shake hands with Thing One & Thing Two?” Meyer held out his hand to shake mine, as he does with the kids he reads to in the clinic. Meyer is a master of making stories come alive in the waiting room. Recently, he recalls reading one of his favorites, The Snow Day, to two boys, Amot and Avat. He replaced “Peter”, the main character’s name, with their own. By doing this, he personalized the story for them and they were engaged the entire time. As they left the clinic, Meyer heard them exclaim to their parent, “there he is, the man who read to us!”. By modeling interactive and engaging reading practices for parents, he hopes that they emulate them at home. While most families do enjoy his reading (he has even had parents take pictures of him reading to their child) he does encounter parents who are not interested in watching. While this can be hard, he says that the families that do appreciate it outnumber those who don’t and it reminds him how important it is to read with kids in the clinics. Meyer also notes that reading in the clinics not only benefits the kids but himself as well. He talks about the numerous times he’s been reading to a child, begins to laugh, and can’t stop. 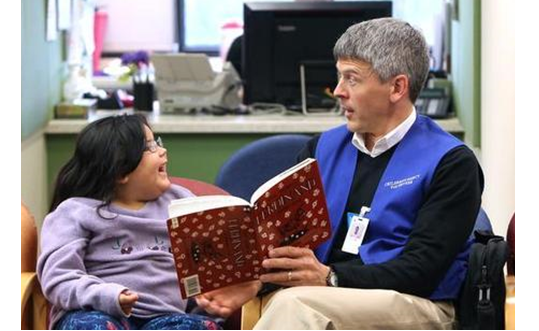 “I enjoy reading as much as the kids enjoy being read to,” says Meyer. It’s a great way to spend his lunch hour and part of the reason he’s been a volunteer reader for so long, he is able to help show the importance of reading while having fun. He says, “It helps the parents, helps the child and helps me too”. 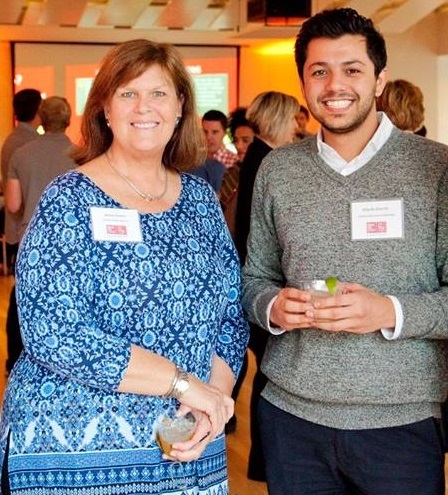 Thank you, Anthony, for being an extraordinary volunteer and supporter of RORKC! 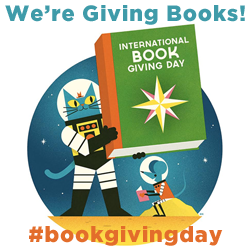 We are turning Giving Tuesday upside down by giving you the chance to win one of two gift cards from Barnes & Noble. 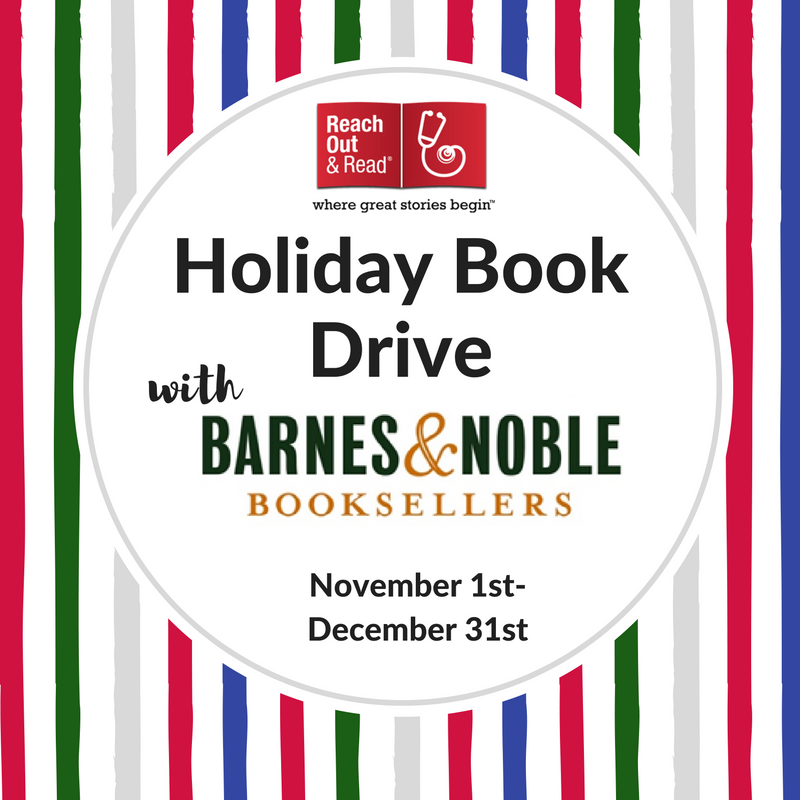 Between now and Nov. 28, host a gently-used book drive benefiting Reach Out and Read KC and be entered to win a $20 or $30 gift card from Barnes & Noble. 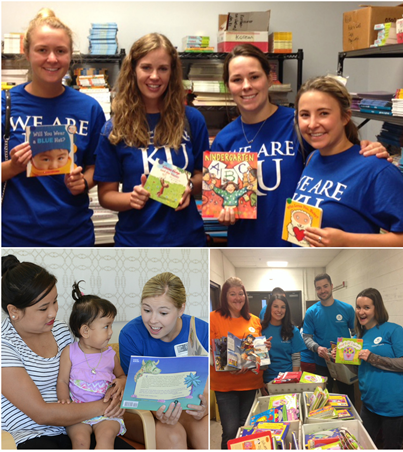 Reach Out and Read KC creates literacy-rich waiting rooms in each of our partner clinics from book donations. Schools, family gatherings like Thanksgiving, workplaces, and churches are perfect places to collect books. To qualify for the contest, donations must be a minimum of 25 books and delivered to the RORKC office by November 28th. The two winners will be announced on Giving Tuesday, November 29th. If you are unable to host a book drive, please consider participating in our virtual book drive or make a donation. The right book at the right time in a young child’s life is key for their development and keeping their interest. 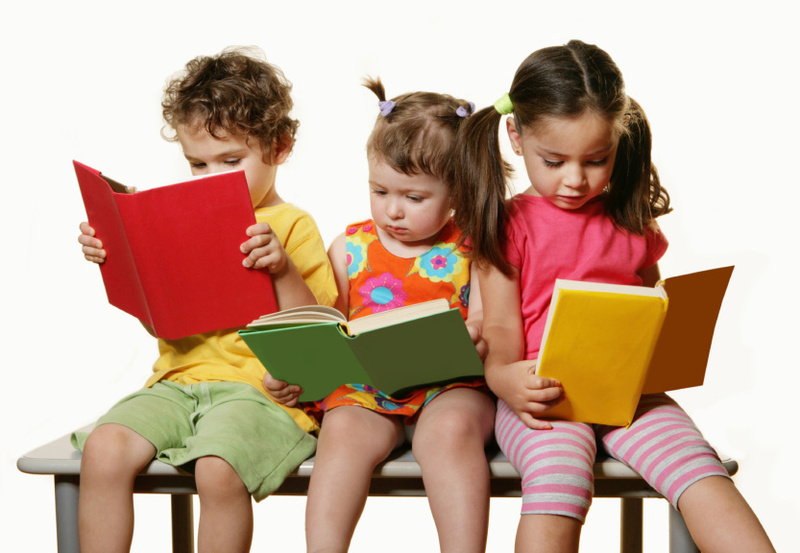 Little ones get bored with books that are “too young” for them and can get discouraged by books that are too advanced. 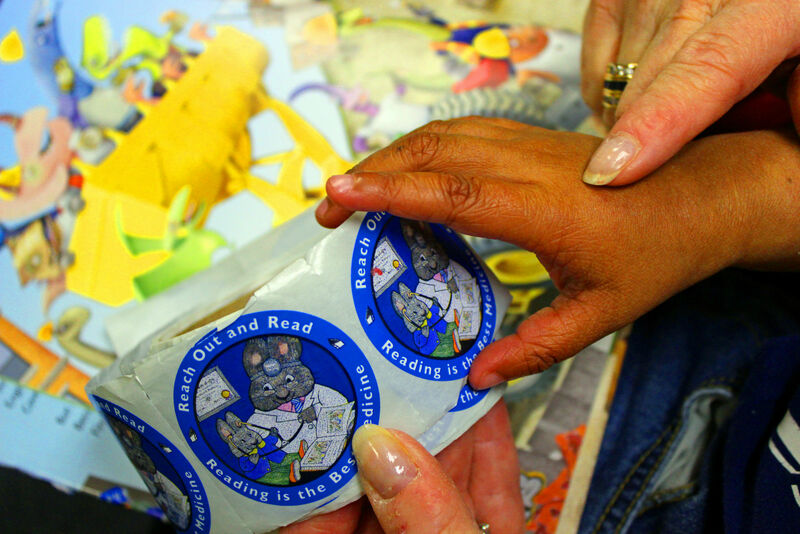 At Reach Out and Read Kansas City, we make sure that every child receives a book that is the best fit for them developmentally at each one of their 14 regularly scheduled well-child checkups. We stock over 200 titles in order to offer many different choices for different age groups, and there are a number of factors to consider when we choose books for each group. New babies, from birth to 4 months, are still working on developing their senses and motor skills, so they enjoy putting things in their mouth to experience them. Starting out, their eyesight is very undeveloped but grows stronger, as demonstrated on the infant vision simulator card presented here. While family members often hold babies closer than the distance designated on the simulator, this gives us some idea about how baby sees the world that they are newly experiencing. At this age, black and white are easier for them to see clearly, so they find high-contrast board books or cloth books most stimulating (and harder to destroy). 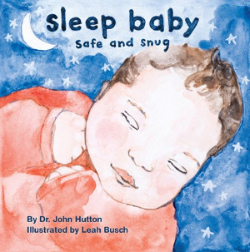 For these reasons, we offer book choices such as “Hello Baby” and “Black and White Nighty Night” to infants 2-4 months old. 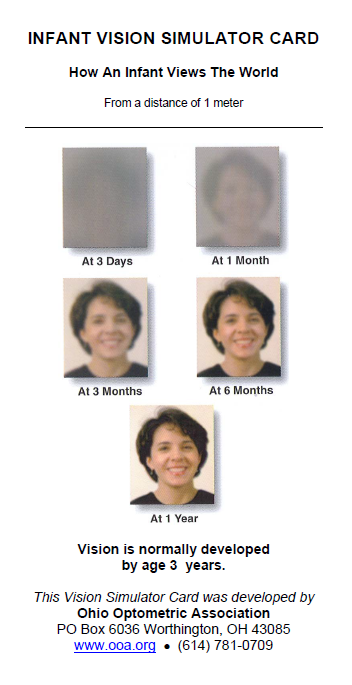 Little ones in this age group are also quickly improving their ability to recognize faces, and at 6 months, can already recognize faces better than they recognize objects. With that in mind, we offer plenty of book choices with lots of faces to look at. Brenda also gave the family a little information about how reading to very young children helps their brains develop so they are better prepared to learn in school. The parents were very excited to see the baby interact with the book by tracking it and smiling! As they understood that their interactions really were beneficial to their little one, they continued to interact with their baby and book through their stay in the waiting room. 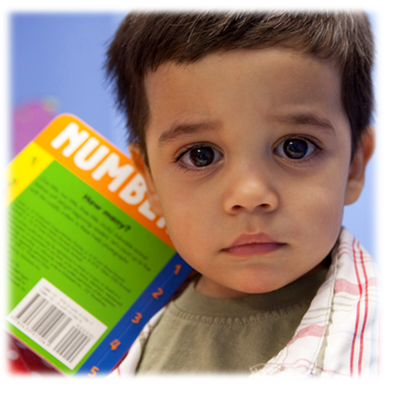 As children grow older, they start to recognize and name objects and are learning concepts like numbers and opposites. 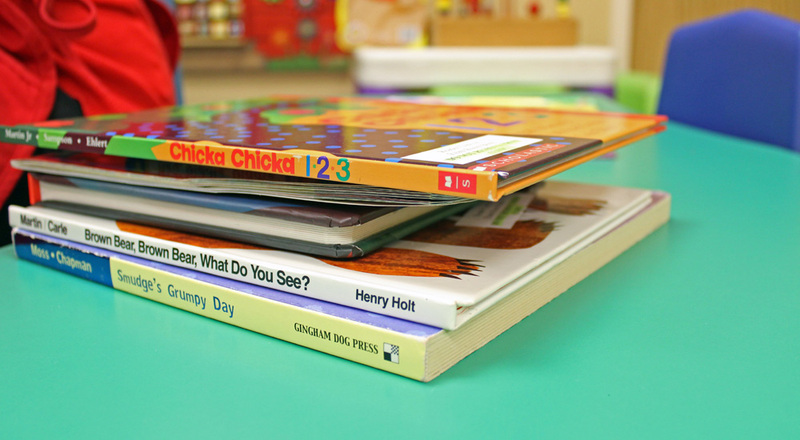 Between 1 and 2 years of age, children can choose books about counting or opposites, or they can choose a book that asks them what different objects are, such as “Brown Bear, Brown Bear, What Do You See?” By age 3, kiddos are ready for books with a story, such as Mother Goose tales. At 4 years, it’s time for a special well-child visit! 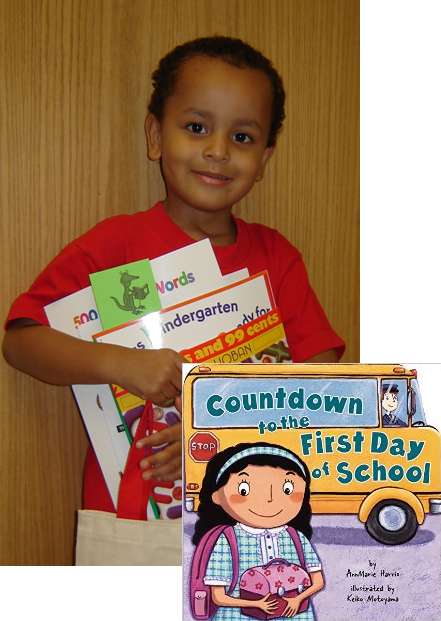 By this age, children are getting ready to start school and Reach Out and Read is ready to help by giving them a kindergarten book bag including their “Countdown to the First Day of School” book, a kindergarten readiness checklist for parents, and some other preparatory materials. 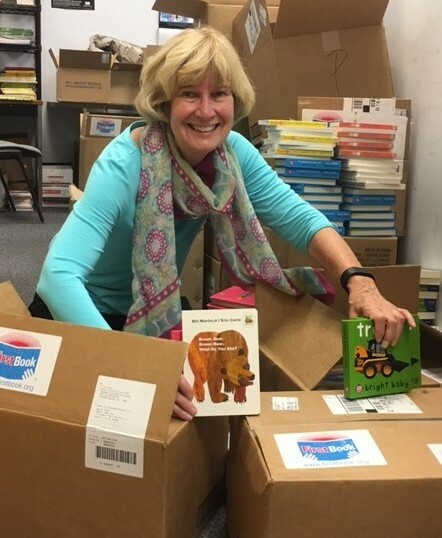 Thanks to Janice Dobbs, our dedicated book coordinator of nearly 15 years, the Reach Out and Read KC team is experienced at and devoted to providing the most developmentally-appropriate book for every age. Equally as important, we also strive to provide the children we serve with books that are a good fit for them in other ways as well. 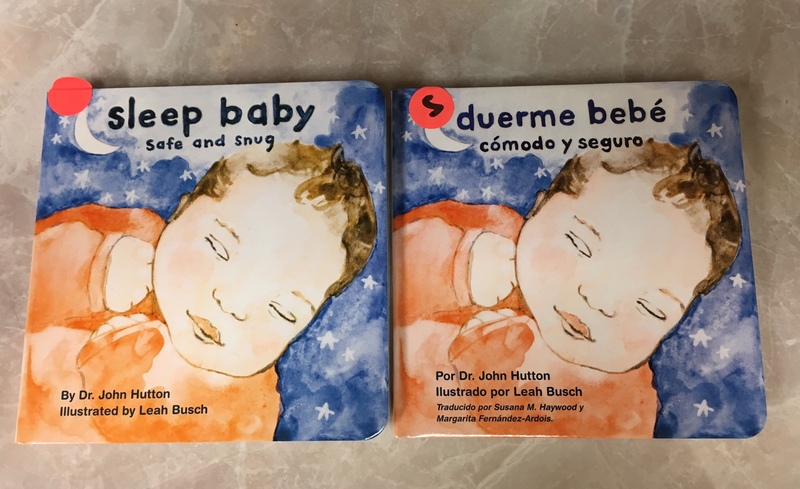 Many families visiting our partner clinics do not speak English as their first language, so we offer bilingual books in 27 different languages (from Arabic to Vietnamese!) 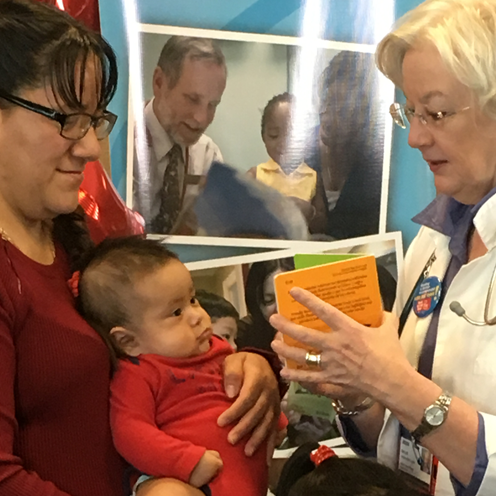 and our medical providers make sure to talk to each family about the importance of sharing books with their young children. 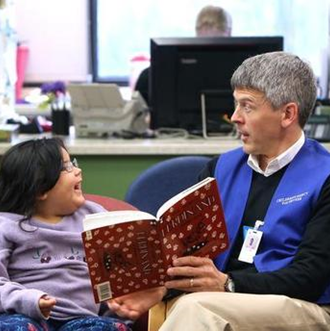 By offering the best book choices to every child served by our clinics, we make sure the Reach Out and Read program has the greatest impact possible. Having access at home to the right book at the right time means a child is more likely to want to return to that book again and again, and will begin their lives learning a love of books and reading that will last through their school years and beyond. 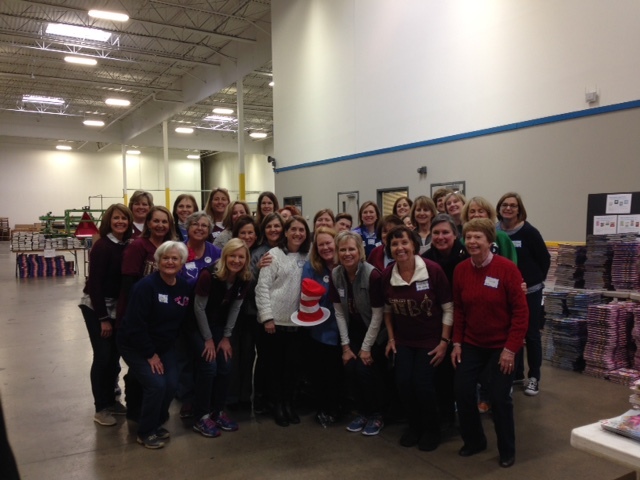 On February 25, the Greater Kansas City Alumnae Club of Pi Beta Phi donated 1,901 books to RORKC as part of a 20,000 book grant from First Book. The Pi Phis have divided these books up and donated them to several local organizations. 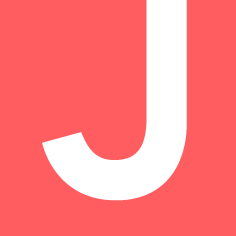 The organizations are listed in this video. 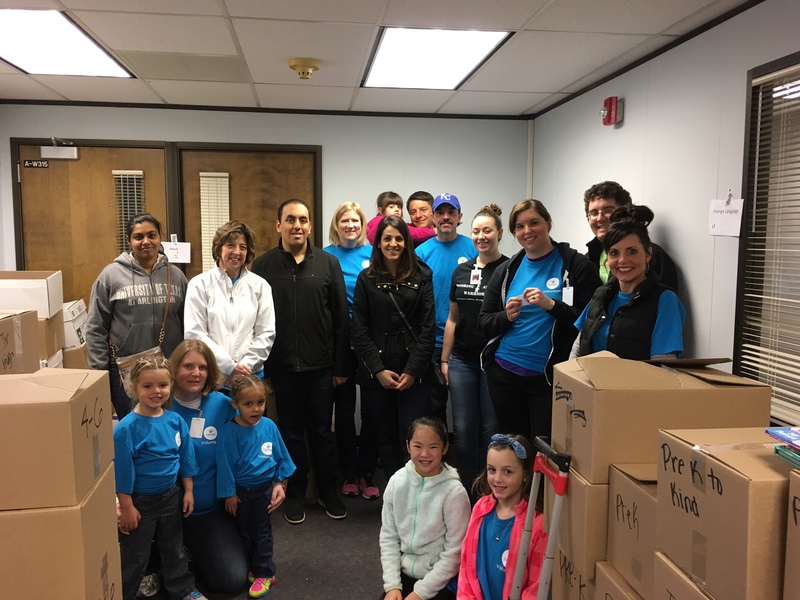 The donation to Reach Out and Read KC includes books for well-child visits, volunteer readers’ book bags, and clinic waiting rooms. 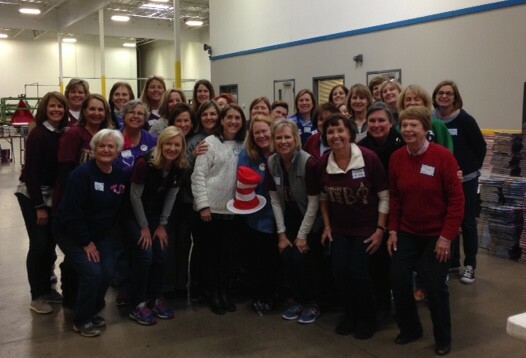 Thank you Pi Phi alumnae for your donation and your continued support over the years. Results from our 2015 annual survey of parents have been tallied and we have good news to share! Of the 1090 families reporting between late August and late October, 99% of families said they received a book at their child’s well-child visit, 94% remember receiving literacy advice from their medical provider, and 83% of parents with children between 6 months and 5 years old say that they read to their children three or more times per week. 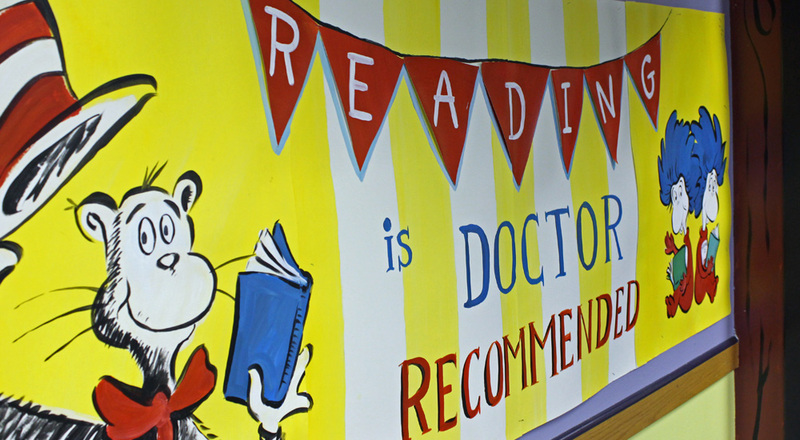 Statistics tell us how many books we provide to children, but this self-reporting from parents is true confirmation that we are fulfilling our mission of preparing Kansas City’s youngest children to succeed in school by partnering with doctors to prescribe books and encourage families to read together. 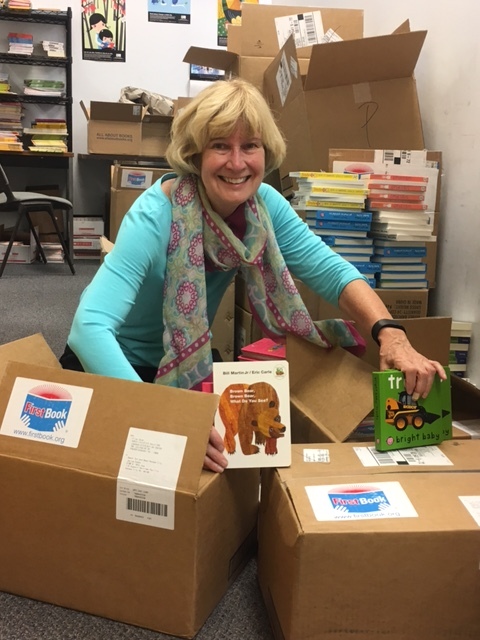 We are so grateful to First Book, a national nonprofit organization dedicated to providing equal access to literacy and educational opportunities for children in need, for supplying for free over 500,000 new children’s books to organizations in Kansas City this September. 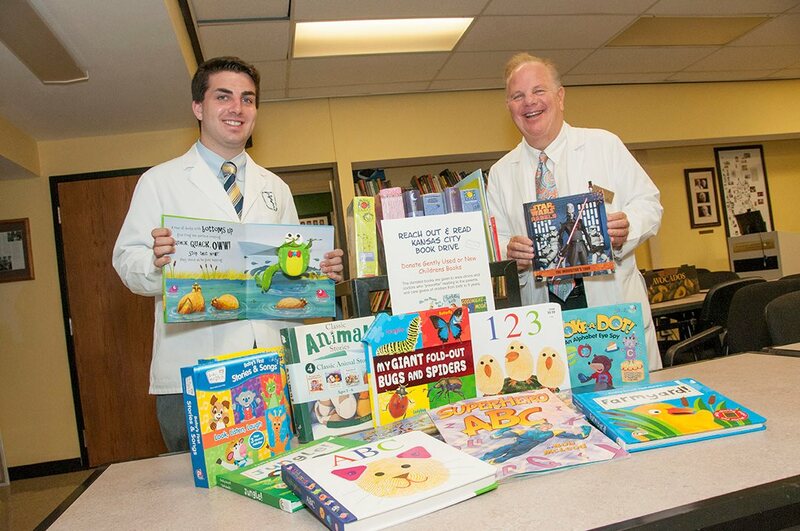 RORKC received 1780 new books for use in our well-child checkups and waiting rooms. Janice and Jenny, our tireless and talented book coordinator and volunteer manager, lined up with representatives of dozens of other local agencies to receive these fabulous free books for our kiddos. Thanks also to our wonderful friends at Turn the Page KC and LINC for organizing this event to benefit our community of young readers. You did it! Because of amazing volunteers and supporters like you, a new fundraising record was set for our ‘Books On Tap’ special event (formerly known as Books and Brews.) Through generous sponsorships, donated event space from the Kansas City Public Library, and amazing food, drinks, and raffle items contributed by dozens of local businesses – not to mention ticket sales to over 200 attendees – you came together and raised over $7,600 to support Reach Out and Read KC. 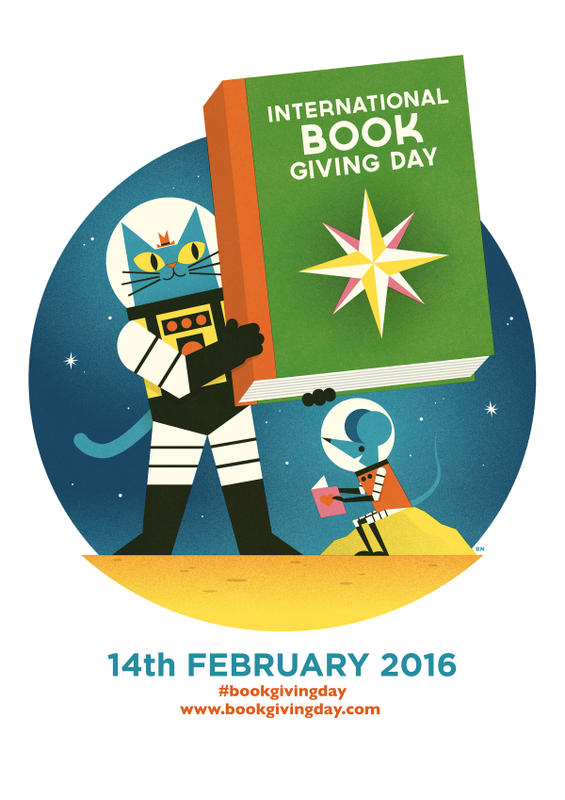 That means over 1500 new books can be purchased and delivered through this truly volunteer led event. We thank Tingle Flooring, Henderson Engineers, and TranSystems for sponsoring the event, but most of all we give high-fives, handshakes, and hugs to committee co-chairs Liz Megli and Kayla Boal and to the entire outstanding committee! 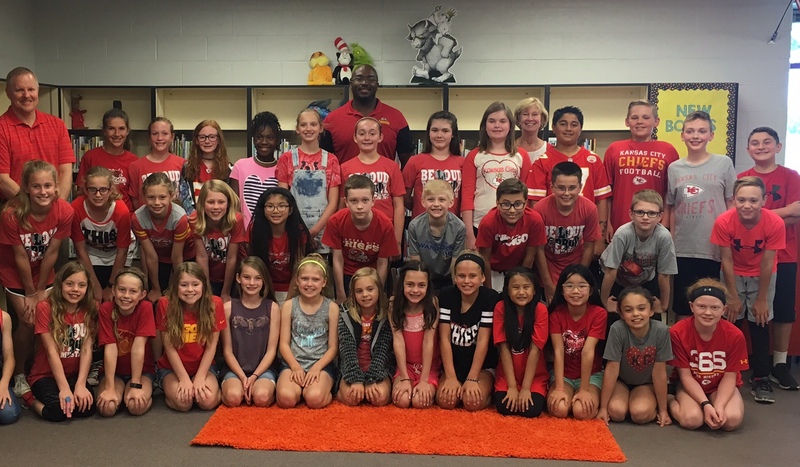 Students and teachers at Pathfinder Elementary in Platte County celebrated International Literacy Day on September 8 by dressing as their favorite book characters and started the day with a building-wide D.E.A.R. (Drop Everything and Read) time. 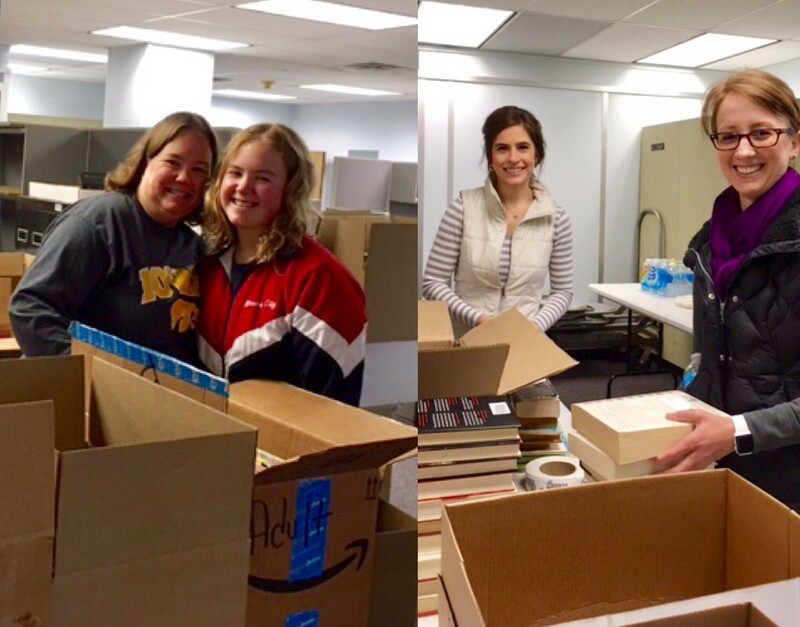 Coinciding with the event, Student Ambassadors organized a service project and collected 344 new and gently used books for Reach Out and Read Kansas City. 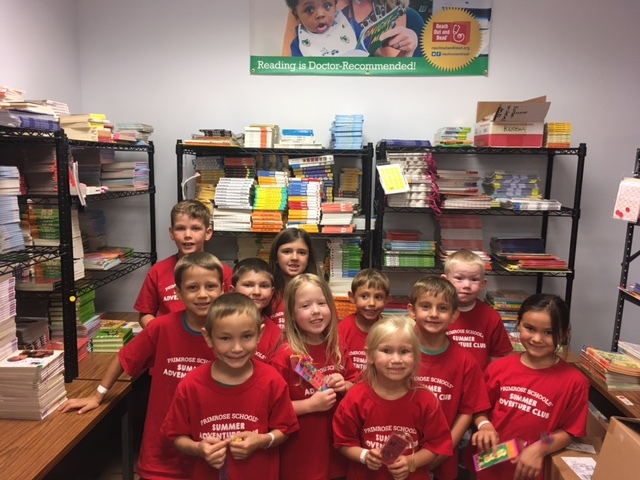 Thank you, students, and an extra special thanks to Jamie Davis, Reading Specialist at Pathfinder Elementary, for suggesting RORKC to benefit from your school’s book drive. Your generosity has helped stock our clinic waiting rooms and made some other children very happy. 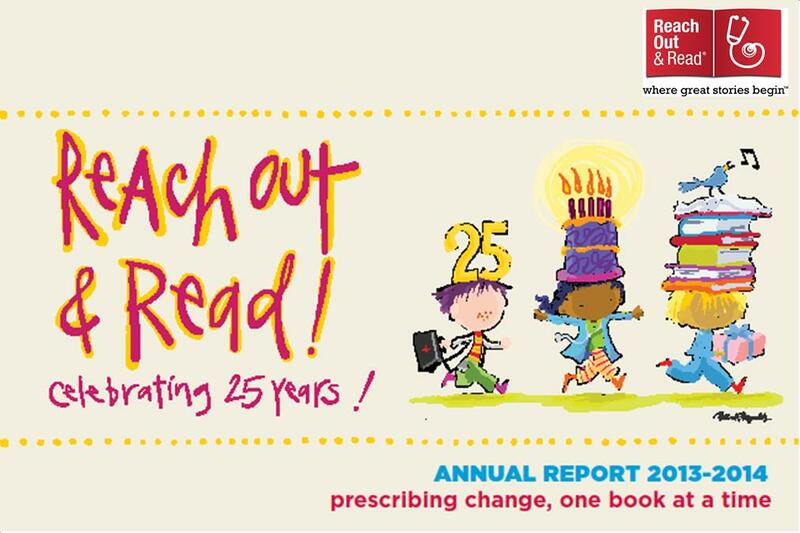 Reach Out and Read national recently announced the launch of the Prescription for Success Toolkit, to support collaborations between libraries, museums, and ROR program sites – natural partners that have a collective impact on the lives of young children. Funded by the Institute of Museum and Library Services, this pilot project aims to help families benefit from museum and library services that foster literacy development in young children. 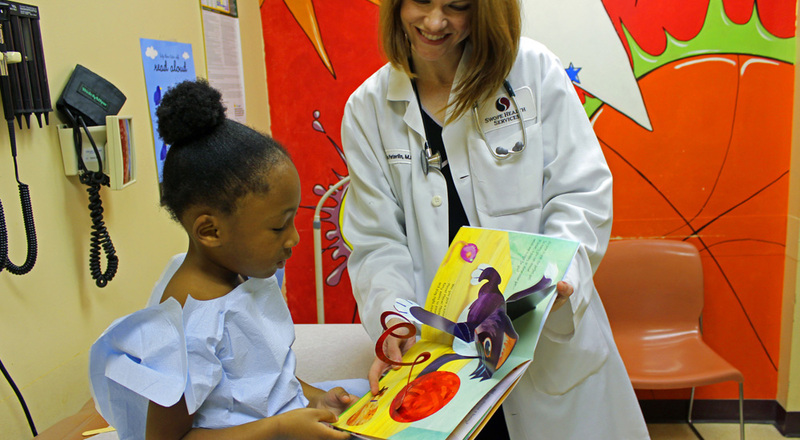 As a national nonprofit organization comprised of doctors, who promote early childhood literacy, Reach Out and Read has deep and broad relationships within the medical community. Prescription for Success has leveraged these connections to explore new ways doctors and their staffs can collaborate with museums and libraries. We are excited to announce the award of $25,000 from the Hall Family Foundation to fund for two years the purchase and distribution of a new book at the one month well child checkup. Providers at our 51 partner clinics see up to 7000 children between birth and 4-months-old each year. Adding a new book at one month provides consistency in the prescriptive message and delivery of our program and extends the library of new books provided by RORKC to a total of 15. 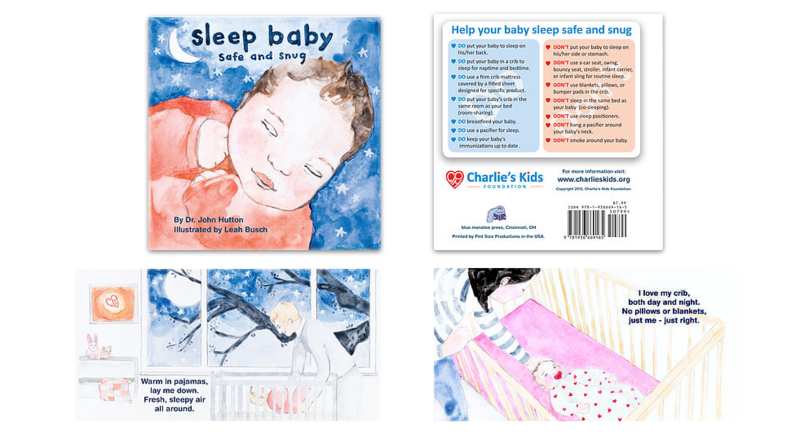 The book selected to launch this program, Sleep Baby Safe and Snug, was created by Charlie’s Kids Foundation for Safe Sleep to reinforce the message of safe sleep habits to prevent Sudden Infant Death Syndrome. It is available in both Spanish and English. 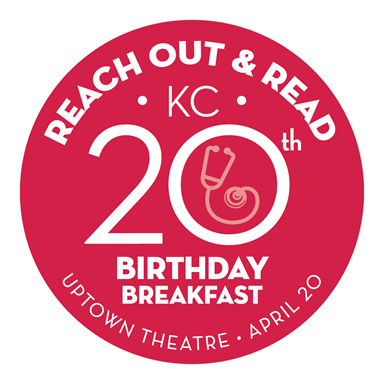 The 9th Annual Green Eggs and Ham Breakfast benefiting Reach Out and Read Kansas City is quickly approaching, Friday, March 6th, 7:30-9:00am at the Sheraton Crown Center Exhibit Hall. In addition to being a lot of fun, this is a hugely important event for us. 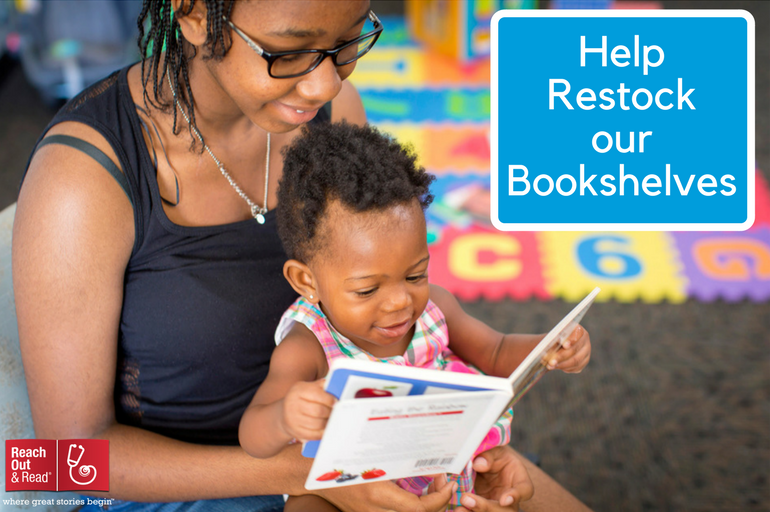 Last year, your support provided a fourth of our annual budget and helped us provide 76,495 new books and prescriptive early literacy advice to 29,836 at-risk children and families. 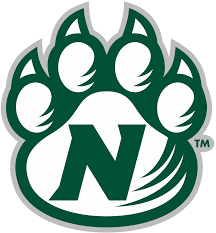 Tickets are on sale now and going fast – get yours today! Individual tickets starting at $60, must be purchased by Friday, February 27th. Register to sponsor a table or make a tax-deductible donation here. Complimentary parking is provided. Registration and coffee service will begin at 7:00. As you arrive enjoy musical entertainment from students of St. Teresa’s Academy and Rockhurst High School. Rumor has it Cat and Fish from The Coterie’s upcoming production of “Dr. Seuss’ The Cat in the Hat” will also be making a special appearance. Come join the party, and do a good deed. 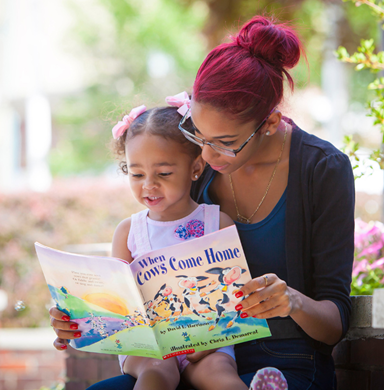 Books at home help kids to succeed! For more information please contact Executive Director Mark Mattison at 913-588-3073 or mmattison@kumc.edu. Everyone knows the holidays are a time for thanks giving and for giving back. 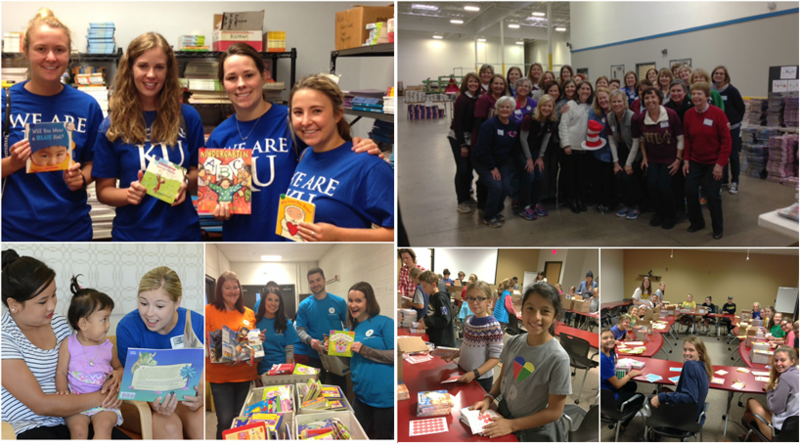 As I reflect on the past year, I am so very grateful to have been entrusted with this wonderful opportunity to spend every day giving back alongside the mighty staff of five, 46 clinic partners, and over 200 active volunteers of Reach Out and Read Kansas City. Also, I am thankful to you, for your past support and ongoing commitment to helping ensure every child in Kansas City will enter school ready to learn. 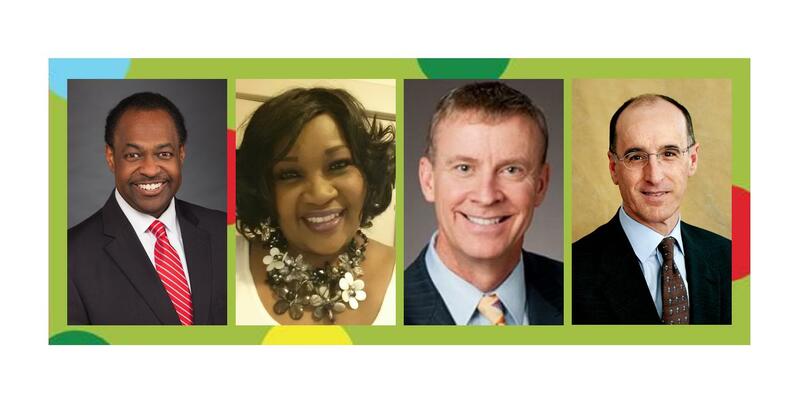 Since coming on board as Executive Director in September, I have been challenged, inspired, and ever-so-honored to play a part in the important work we do and the contributions we make to improve the lives of children. Not only do I hear it every day in testimonials from our volunteers and clinic staff, in a recent Parent Survey 98% of our families reported getting a book at their child’s well-child visit, 95% of families reported getting literacy advice, and, as a result, 82% of families reported reading to their children three or more times per week! As you take a moment to give thanks this holiday season, I invite you to share your good fortune by also giving the gift of literacy – truly a gift that keeps on giving. 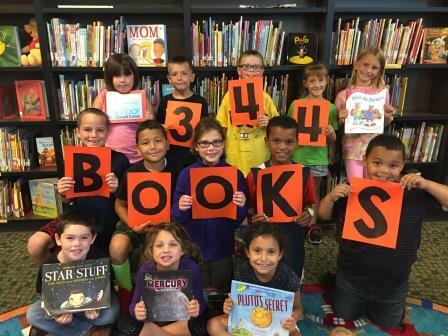 A donation of just $60 to Reach Out and Read Kansas City provides a child with their own starter library, a new book received at each well-child visit from birth to 5 years old. Your gift will spark the joy of learning in thousands of children throughout Greater Kansas City. 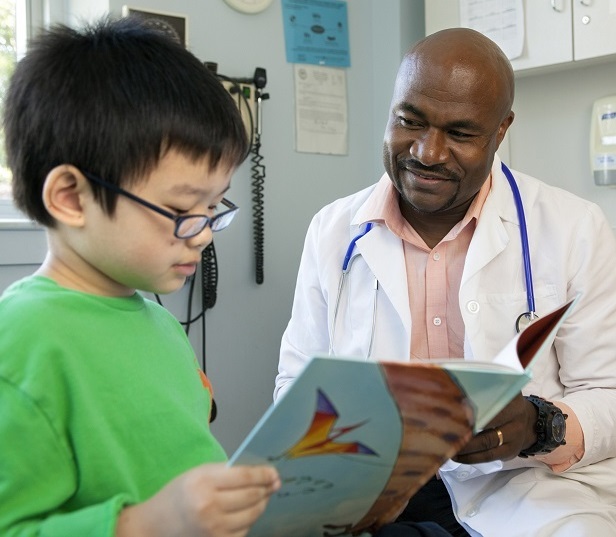 Thanks to you and other advocates, in the next twelve months medical providers will meet with parents over 72,000 times to prescribe the importance of sharing books with their children. 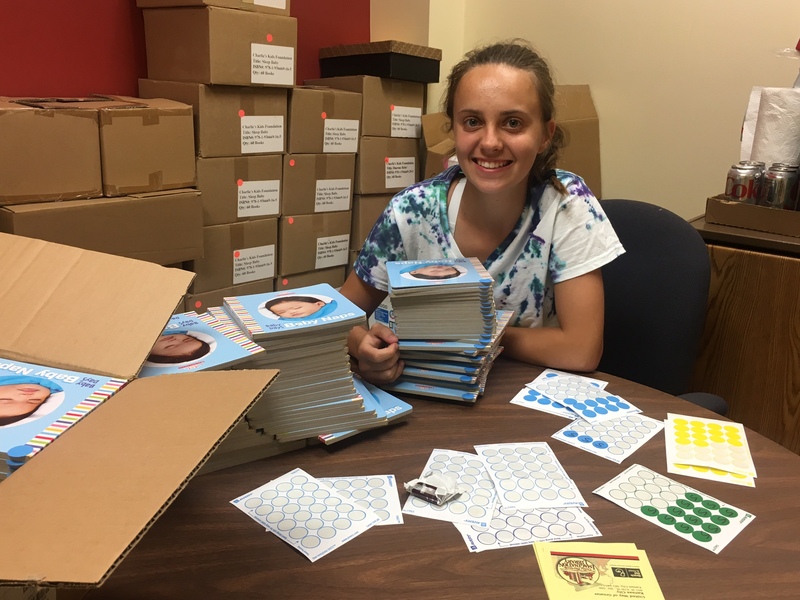 30,000 children will take home a brand new age, language, and culturally appropriate book from their well-child pediatric appointment. 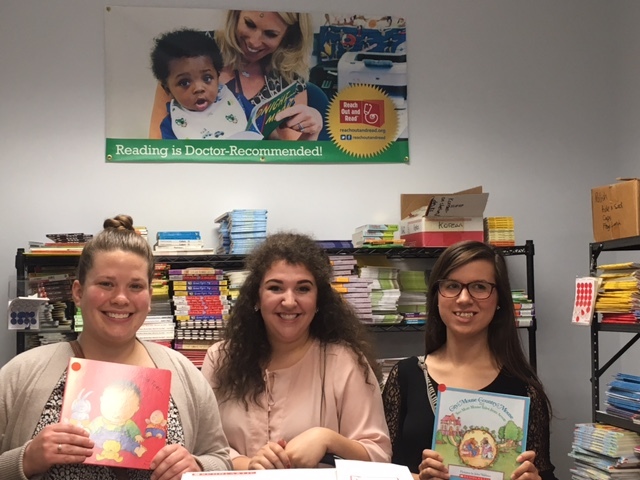 And volunteers trained and provided by Reach Out and Read Kansas City will model book sharing skills as they read to children in clinic waiting rooms. 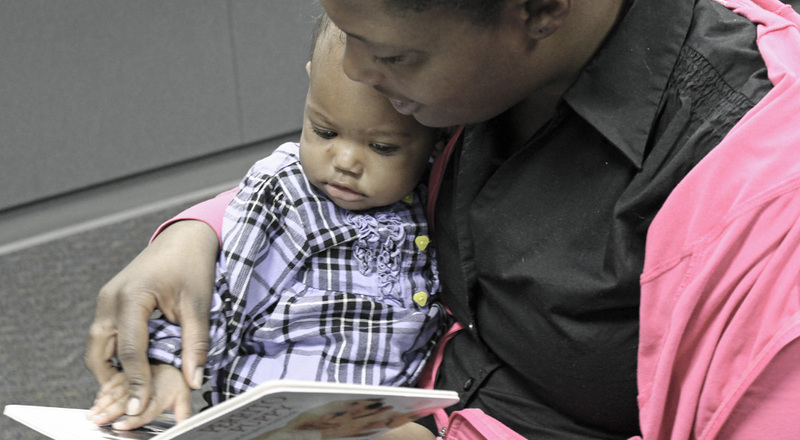 Research confirms that parents who receive literacy counseling from their health care providers, according to the Reach Out and Read model, are more likely to read to their young children, read more often, and have more children’s books in their homes. 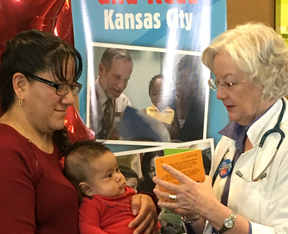 Over 70% of the children who visit Reach Out and Read Kansas City clinics come from low income families, and many of these families are struggling just to cover the basic necessities of food, rent, utilities, and transportation. They wish they could provide books for their children but their hard earned paycheck just doesn’t stretch that far. 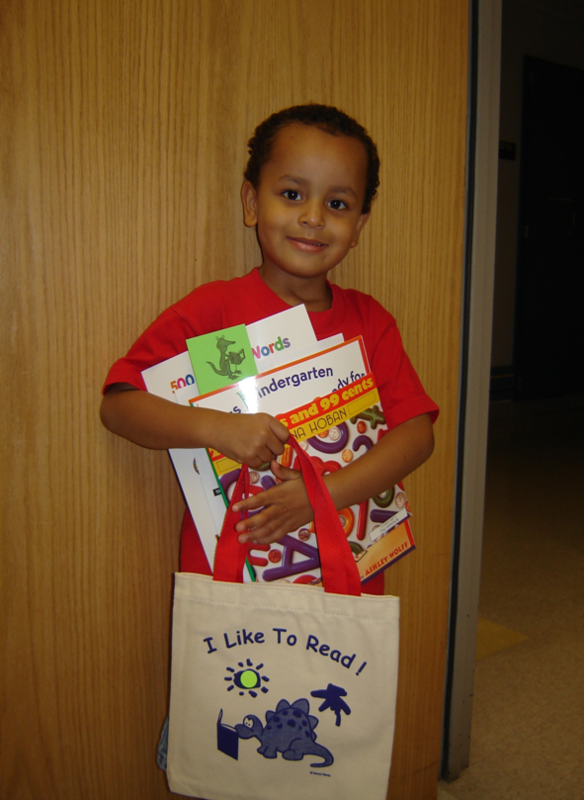 With your gift, Reach Out and Read Kansas City can help these children start the first day of kindergarten having experienced the joy of owning their own book, ready to read and learn. Imagine growing up and not having a book to call your own. That’s the reality for many children in the Kansas City area. 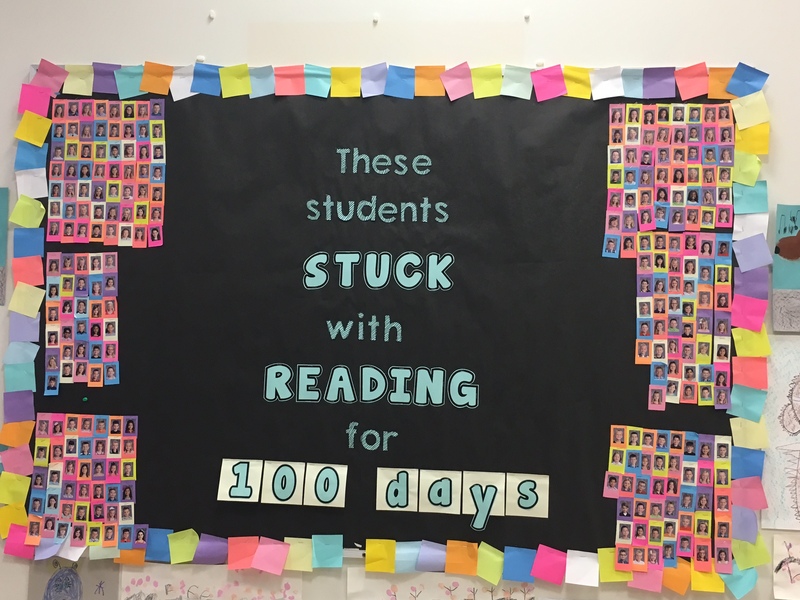 Our local schools, however, are helping change that by joining our 2015 Hooked on Books School Challenge. It’s easy to get involved. Complete an online application to be a school participant in the challenge. Donate your time and register to be a Hooked on Books volunteer. For nonprofit organizations and schools serving at-risk children, apply to be a book recipient. For further information, visit our event page or contact Nancy Fuller, Hooked on Books Chair, at 913-940-8219. 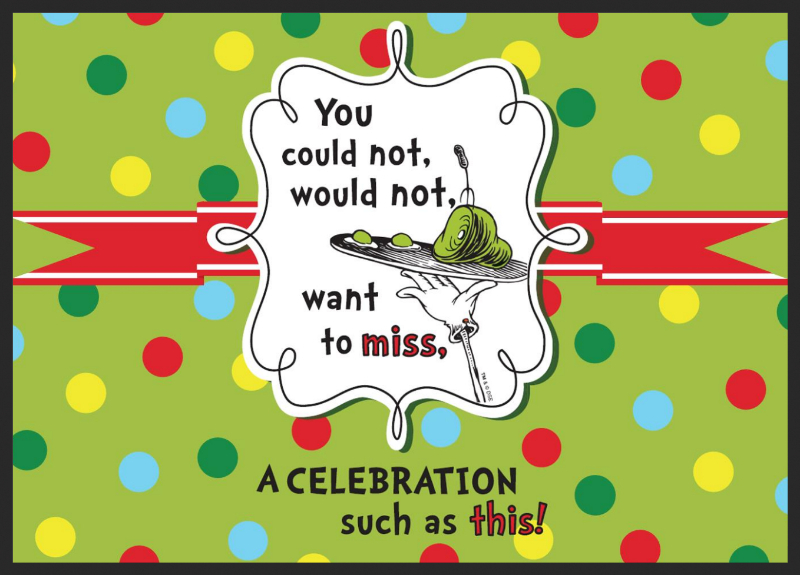 The school that collects the most books per student within the designated time period will be recognized at our 9th Annual Green Eggs and Ham Breakfast on March 6th. 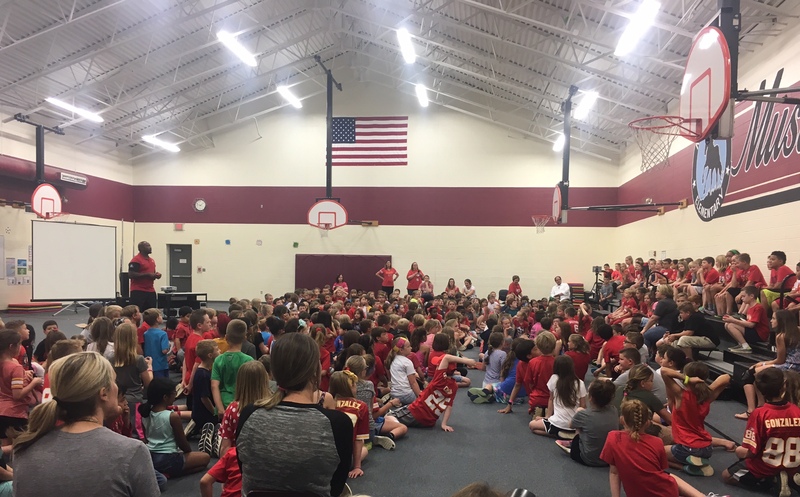 In addition, the winning school will be awarded a $500 Scholastic Books gift certificate and an assembly celebrating their accomplishment. The biggest winners of all, however, are the disadvantaged children. Without your school’s participation, they may not realize the joy of having a book to call their own. “I think both Hooked on Books and Reach Out and Read Kansas City are key players in improving literacy and access to books for some of the neediest children in Kansas City,” says Fuller. 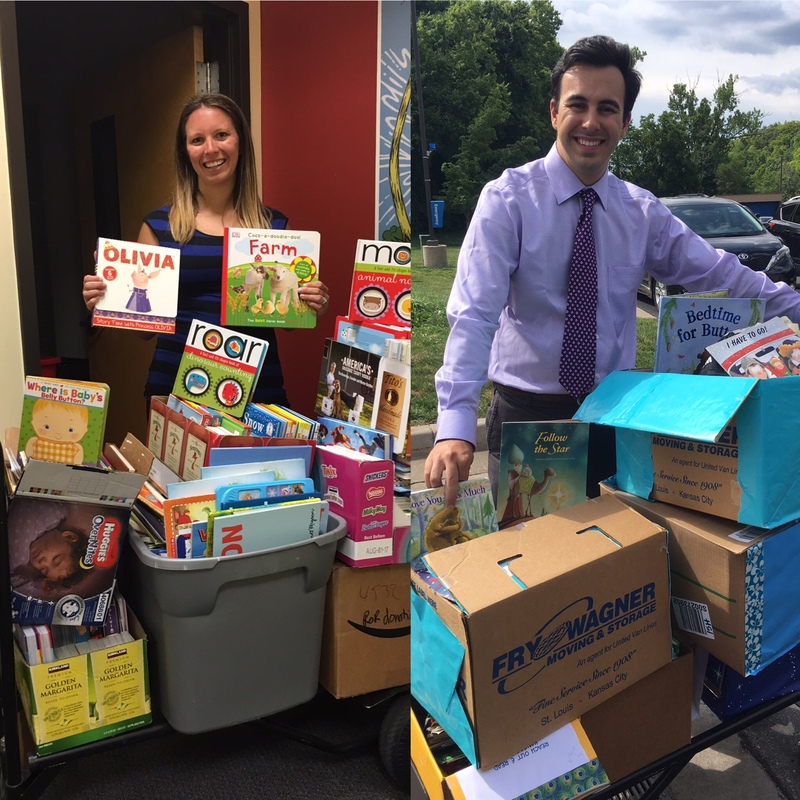 In fact, over the past 15 years, nearly 795,000 books have been collected through the school challenge and distributed to agencies and schools serving lower-income families. Results from our annual survey to parents have been tallied and we have good news to report! Of the 1085 families reporting between late August and late October, 98% of families said they received a book at their child’s well-child visit, 95% remember receiving literacy advice from their medical provider, and 82% say that they read to their children three or more times per week! Purchasing, delivery, and inventory statistics tell us how many books we provide to children by way of our clinic partners, but this self-reporting from parents is true confirmation that we are fulfilling our mission of preparing Kansas City’s youngest children to succeed in school by partnering with doctors to prescribe books and encourage families to read together. 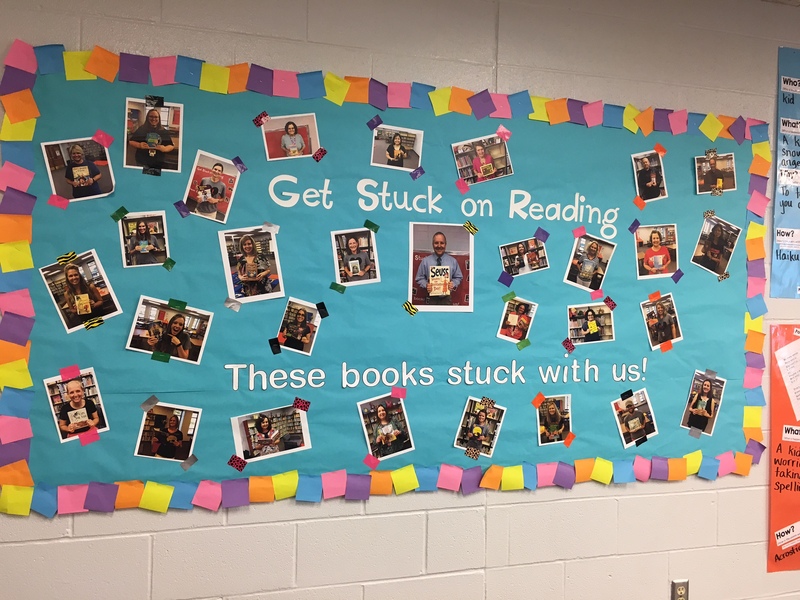 We want to be sure all of our families receive literacy advice and a book. This survey shows that we are doing well—almost all of our families are getting advice and books and this is translating into a high percentage of families sharing books with their children three or more times per week. Thank you to all our supporters and especially to our providers for making early literacy a critical aspect of your pediatric practice! Our national chapter of Reach Out and Read was featured on The Today Show! It was an incredible piece about Dr. Carolyn Boone, one of Reach Out and Read’s pediatricians that serves in Richmond, Virginia. Dr. Boone and her story were featured as part of Today’s “Hope To It” series, which highlights people who have overcome adversity and are now giving back in their lives. 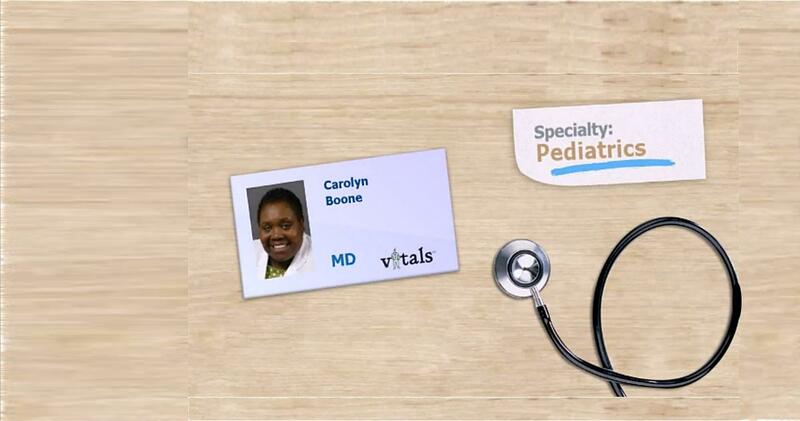 Dr. Carolyn Boone is more than just a pediatrician of 30+ years. She is also a mentor, a teacher, and a part of the families of the patients she serves. 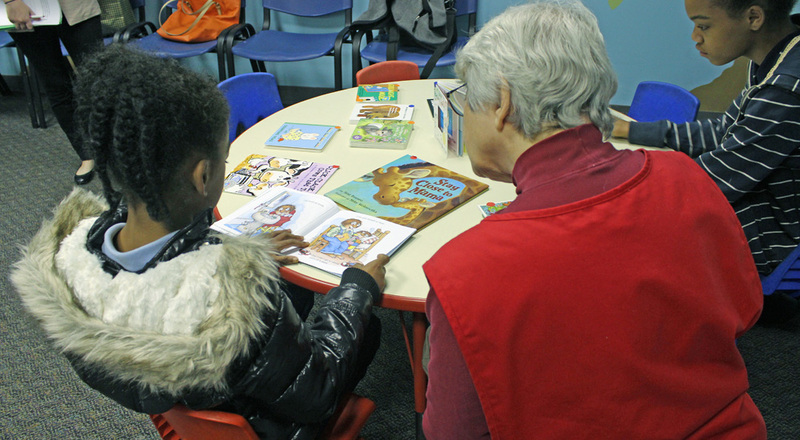 As part of her involvement in the Reach Out and Read program, she starts each appointment with a book, understanding the vital importance of reading. Dr. Boone was a child of teenage pregnancy, raised by a foster mother on a small farm without much, but she did have books — and the message to pass along her love of reading to others throughout her life. She became a doctor, dedicating her life to low-income families and adopting an holistic approach to medicine. “Books are just as important as an immunization,” says Dr. Boone, noting that books make sure the brain develops properly and are a way for parents to interact and talk with their children. 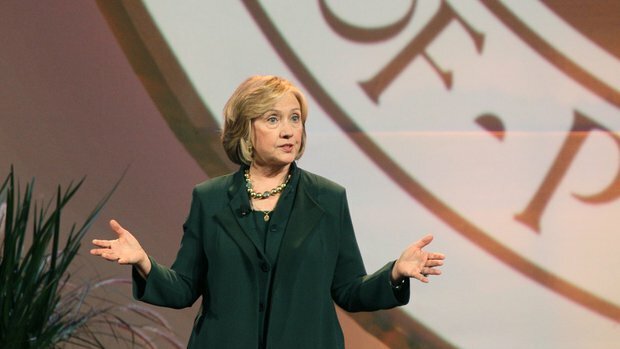 Every day she promotes literacy and offers hope to the families she serves. The piece truly captures the power of Reach Out and Read, and how together through reading, we are changing lives, families, and futures. If the video does not work, watch the piece here. For just $60 you can contribute to a child’s lifetime of success. 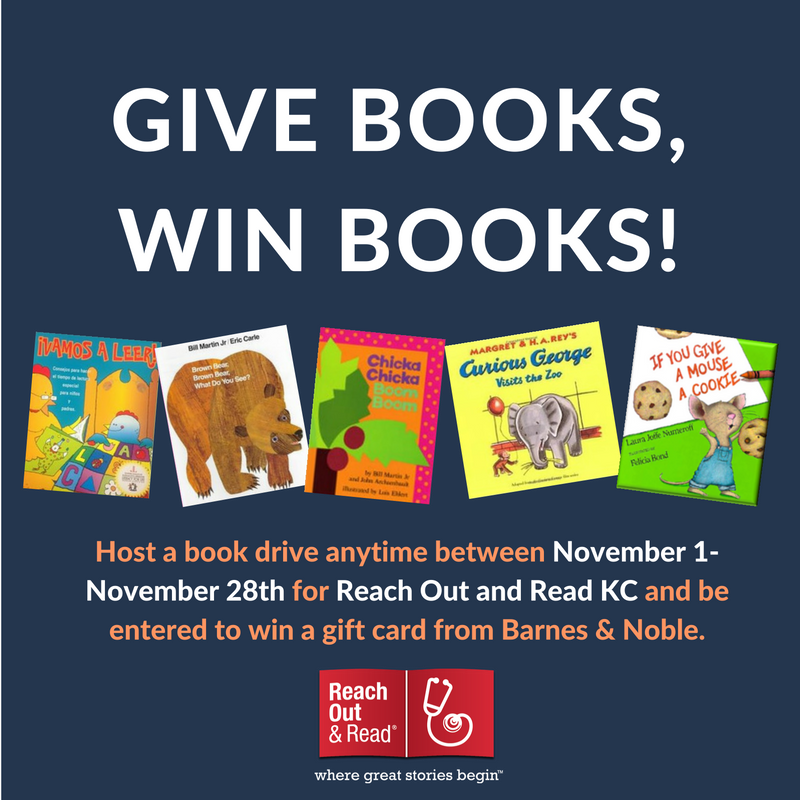 Join Reach Out and Read Kansas City in our mission today and help us provide books to thousands of children who need them tomorrow. Donate here. Every night before she goes to sleep, five-year-old Olivia runs to her book shelf and pulls out her favorite book, Five Little Monkeys Jumping on the Bed. It takes her less than two minutes to get situated comfortably in her mom’s lap before she hands the book over and says she is ready to read. As her mom begins the story, Olivia soon chimes in line by line, word by word. You see, the book Olivia is so excited to read is a very special book she received at her three-year-old well child checkup from her pediatrician. She has read the story at least two hundred times, but that doesn’t matter. Every night before bed, she gets to escape into the story and become one of the characters, she gets to leave the real world and become part of the book’s fantasy world. Olivia may only be five, but thanks to Reach Out and Read Kansas City, she has already developed a love of reading and is ready to enter kindergarten and succeed. This is just one success story from Reach Out and Read Kansas City. There are 29,000 more stories of kids just like Olivia who are learning to love books and reading. It is our hope you will help us ensure these children continue to have books to call their own. We want to make sure children enter kindergarten ready to learn, and with your help we can do that. 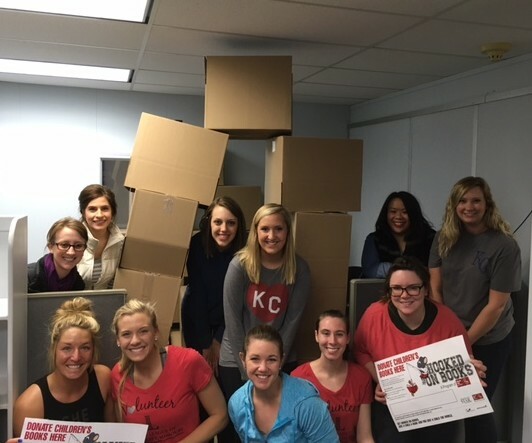 No matter the size of your gift– $5 to sponsor a new book or $60 to sponsor a child throughout the five year program or $250 to sponsor a small clinic–you are making a difference in the lives of Kansas City kids. 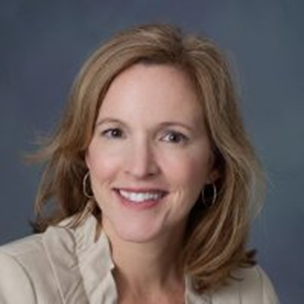 The following post is a guest blog from Libby Hastert, an online content writer, and a volunteer, close friend, and supporter of Reach Out and Read Kansas City. To view her original post on her own blog, please click here. “I grew up with books. Literally sitting on them in the classroom and sleeping on them during naptime. Before I could even read, I had an innate understanding of what books represented. 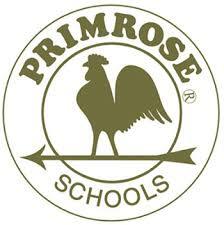 Teachers had them. Librarians had them. My parents and older sisters had them. Other things these individuals had? Intelligence and independence. So, naturally, I deduced that reading books equated to power. And I wasn’t too off base. Reading books ushers in an exciting world of possibilities that stems from newfound knowledge — knowledge acquired from reading books. The funny thing about my obsession with books is how much I struggled with reading at an early age. It wasn’t my missing two front teeth, knocked out on the Jungle Gym, that kept me fumbling over sentences, though. For whatever reason, I was a late bloomer when it came to reading. Fortunately for me, I had parents, teachers, tutors, and older sisters to show me the way, introducing me to the mischievous adventures of “Junie B. Jones” and so many other action-packed titles. 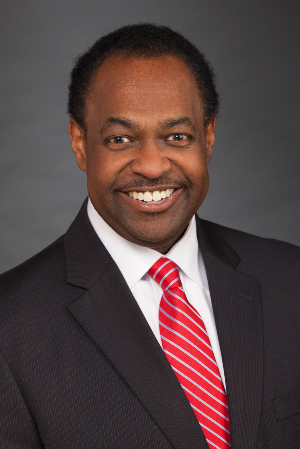 Sadly, we live in a world where many children — our very own Kansas City youth included — don’t have the access to the overabundance of resources I had. In fact, many do not even have books to call their own. According to the National Education Association (NEA), children from families below the poverty line are less likely to experience daily, in-home reading. 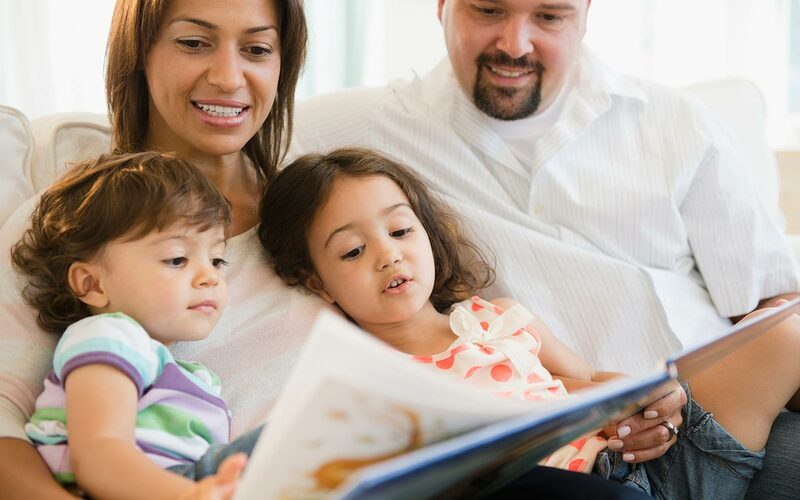 In another study, the NEA discovered that in-home reading plays an instrumental role in healthy child development and enhanced reading proficiency. What makes the absence of reading so problematic? What’s most concerning about this phenomenon, is that the early years of child development have a large impact on the learners children become. “Children develop much of their capacity for learning in the first three years of life, when their brains grow to 90 percent of their eventual adult weight,” reported the U.S. Department of Education. As a result, the absence of reading becomes a problem for many kids well before the school years begin. 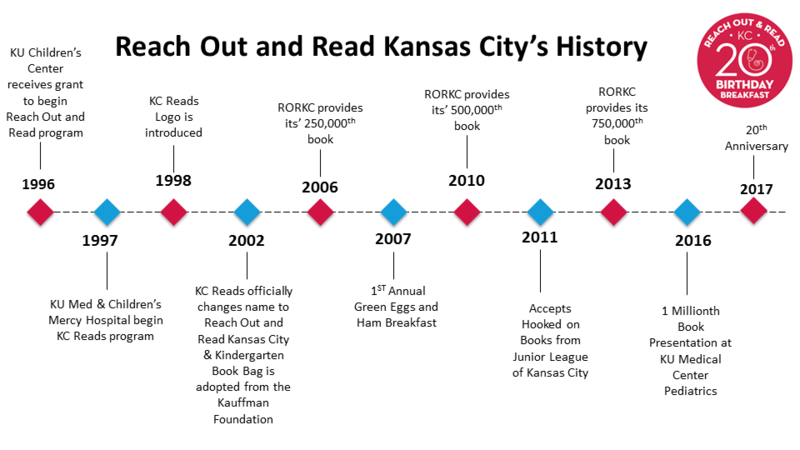 With many children not having access to the basic necessities they need to flourish, promoting literacy through local programs like Reach Out & Read – Kansas City (RORKC) is more important than ever. As somebody who was fortunate enough to have a collection of books so large it poured off the bookshelves, onto the floor and into my bed, I can appreciate the wonderful efforts RORKC makes annually. And as a proud volunteer, I’ll take a moment to brag. 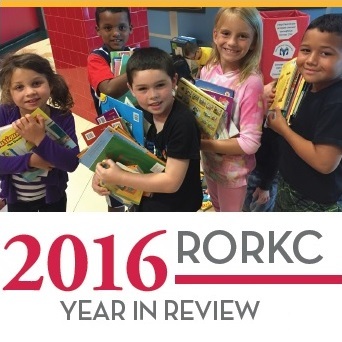 RORKC annually provides over 72,000 new books for more than 28,000 low-income children who are 0-5 years old. 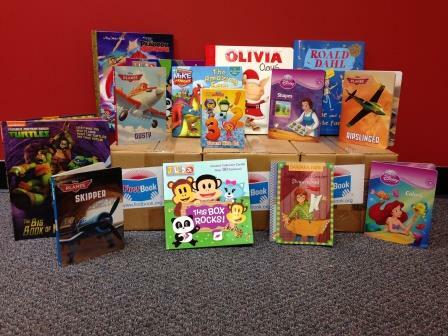 Book donations are issued during well-child visits at our local, partner clinic sites. Children in the program ultimately acquire a 13-book library before entering the education system. Fundraising isn’t all bubbly and door prizes. 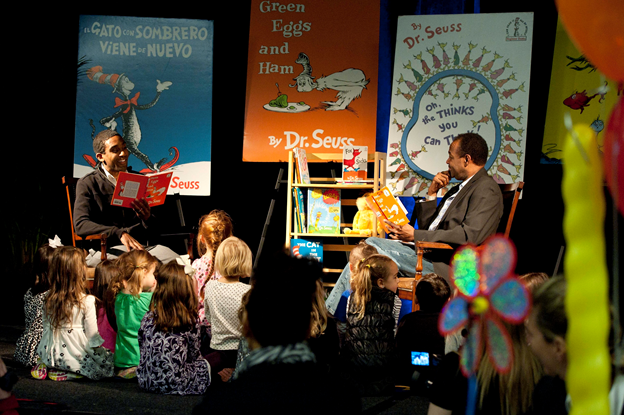 However, twice a year we host events, designed to raise money and awareness about children’s literacy in the Kansas City area. 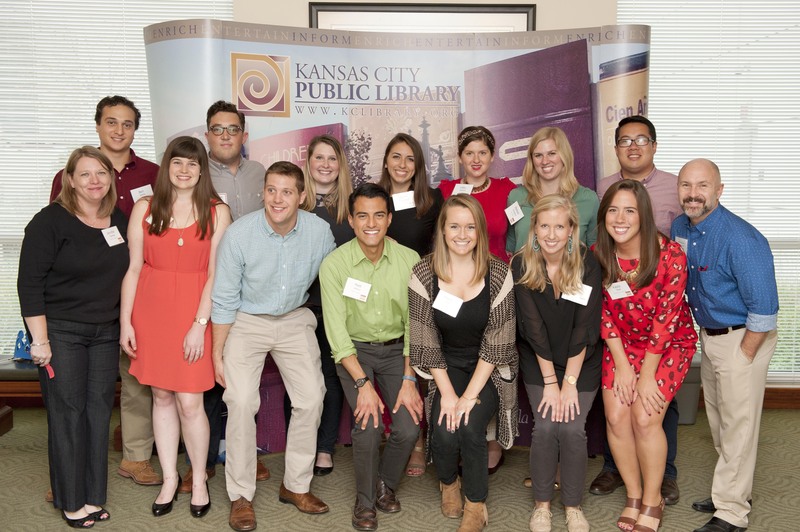 This week, Kansas Citians have the opportunity to party for a purpose at our 3rd annual Books & Brews fundraiser. Below is the scoop on the upcoming, not-to-be-missed event. 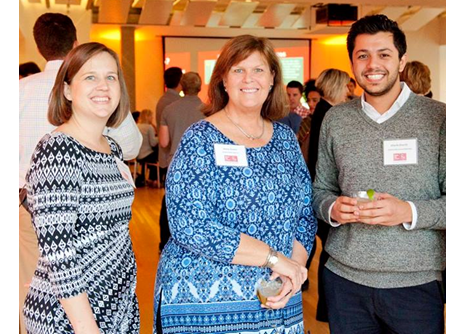 You’ll find lots of book-loving folks who want to drink beer while promoting literacy. Friday, September 26, 2014, at 5 pm sharp. The Kansas City Public Library Central Branch. Snacks, libations, and a raffle will be held inside, and a beer garden party, underneath the lights of the Kansas City skyline, will be located on the rooftop. Party with a purpose. 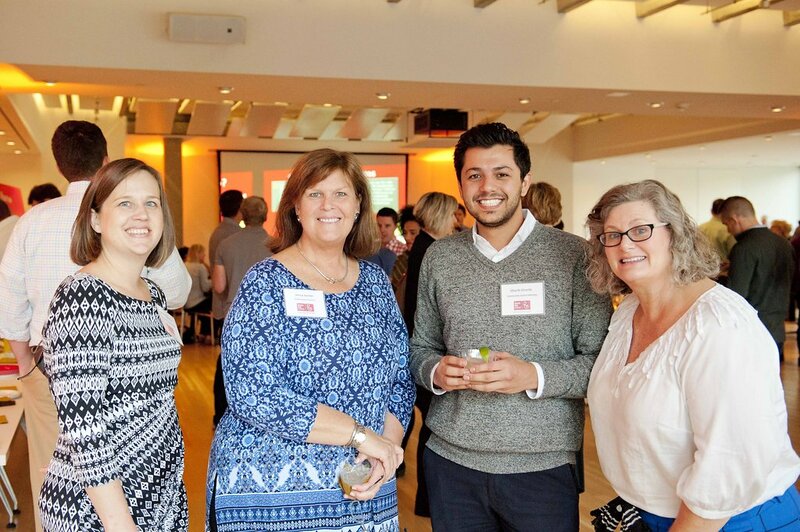 Our third annual Books & Brews event comes complete with an evening of libations, tasty bites, and a fun raffle and door prizes. Drinking beer is fun, but you can do that any other night of the week. Drinking beer and raising money for children’s literacy is awesome, and it’s something you can only enjoy one night a year. Early literacy has become a popular topic this week as the American Academy of Pediatrics issued its first-ever policy statement focused on literacy promotion. The policy calls for pediatricians to advise all parents about the many benefits of reading aloud, which promotes literacy and motor skills. 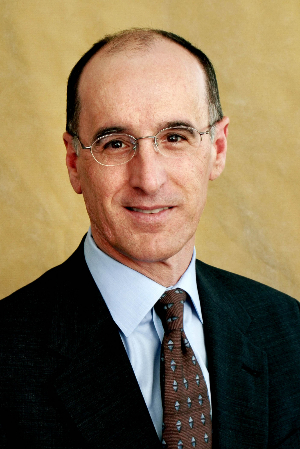 The new statement, aimed at 62,000 members of the American Academy of Pediatrics’, urges pediatricians to talk to parents about how critical reading aloud is for children’s brain development and literacy skills, and to provide books during visits for all low-income, high-risk children. Reach Out and Read Kansas City is extremely excited to see how this new policy affects children’s development and enhances their lives. 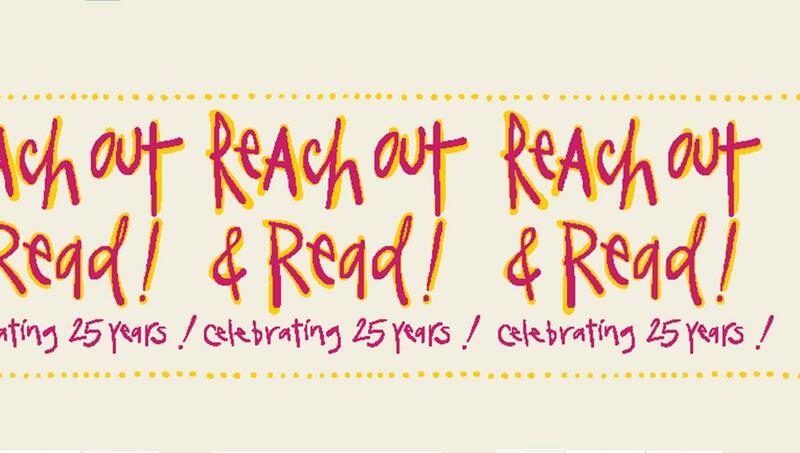 For 25 years, Reach Out and Read has trained doctors and nurse practitioners to give books and early literacy advice at well-child visits, and now that it is becoming an official policy for all pediatricians to follow, even more parents will understand the importance of reading to their children every day. Studies have shown that every year, more than one in three children enter kindergarten without the language skills required to learn how to read. In low-income families, children hear very few words by the time they are three. Reach Out and Read works to solve this problem every day and the American Academy of Pediatrics’ new policy is another step in the right direction. Now, there is nowhere to go but up as we continue to fight for children’s literacy and hope to witness even more children enter school ready to read and succeed. 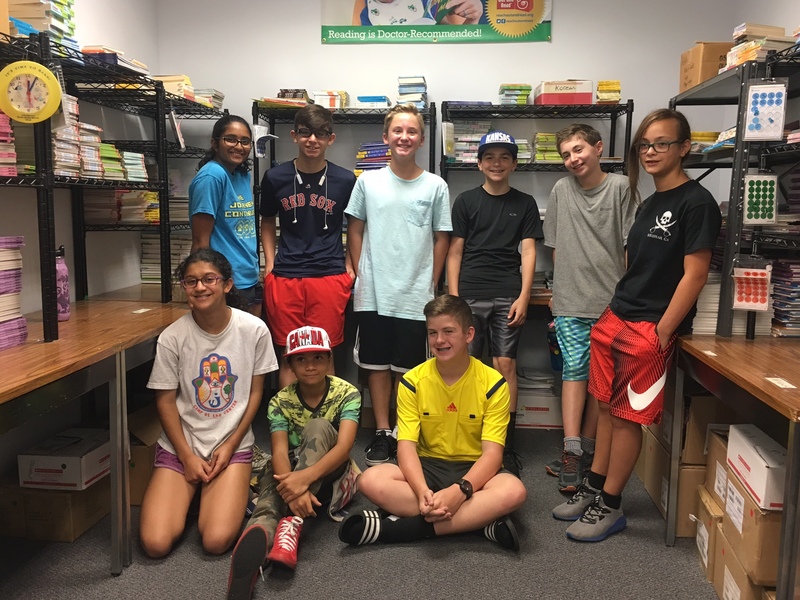 A Reach Out and Read Success Story! Earlier this year, I experienced the direct impact Reach Out and Read Kansas City made on a young girl who went through the program. Back in September, I was working with the Blue Valley High School CAPS film class to put together different impact videos that showcased Reach Out and Read Kansas City’s message. I developed the concept of having real kids in the videos to really show the audience who it is our program helps. I began a search to find young children who took part in the Reach Out and Read Program and benefited from receiving a book at each well-child visit. This is how I met Joslyn. The minute I met her I could tell she was a very bright little girl. I was given Joslyn’s name through one of our hospital coordinators and from there I contacted her mom to see if she had any interest in being in our videos. Her mom immediately agreed, saying Joslyn loved being the center of attention. When I met her, she was actually quite shy at first. But as soon as I asked her about the chapter book, Polyanna, which she had clutched to her chest, a wide smile appeared on her face and she began to go into detail about the story. Joslyn just turned six years old and she was already reading chapter books that kids twice her age read. It was amazing to see her come out of her shell as she explained the different adventures Polyanna went on. Reach Out and Read Kansas City helped kick start Joslyn’s learning by giving her a book during each stage of her development, and by six years old she could read all on her own and loved doing so! Months later, I received an email from Joslyn’s mom saying that Joslyn has great problem solving skills, a good grasp of cause and effect, and is in the highest reading group in her kindergarten class. 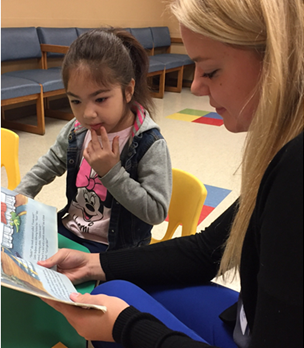 She believed that reading to Joslyn since she was a baby helped her learn how to read. At the end of her email she added, “thank you Reach Out and Read for allowing Joslyn to have this experience.” That right there is why we do what we do. All kids deserve the opportunity to grow up with a bright future, Reach Out and Read Kansas City jump starts that process by making sure each child who takes part in our program enters kindergarten willing and ready to learn. April is Volunteer Appreciation month and I must say that after observing our volunteers in action, they really are the back bone of Reach Out and Read. It is always amazing to see how invested they become in our program no matter what they do, whether that’s reading at the clinics, helping in the office, or serving on one of our event committees. Some of our volunteers have been with us for 10 plus years and they continue to come back to dedicate some of their time to Reach Out and Read Kansas City each and every week. We are truly grateful to every single one of our volunteers. You all help us make a difference in the community, enhance children’s lives, and share with them one of the most precious gifts of all, the gift of reading. Check out some awesome volunteer stories below. One time a little girl that came into the clinic was very shy. She wouldn’t talk but finally got up the courage to come over to the little table where I was sitting with a book. I started reading Clap Your Hands by Lorinda Bryan Cauley. The book has lots of actions. I was doing the actions at first and then she started doing them with me. Before she was called back for her appointment, we were dancing and twirling around the waiting room together, acting out the book we were reading. We both had a lot of fun! One little boy was never called in to see the doctor, while other kids who were listening with us were. I thought that was odd, until I finished the book and the mother asked if we were done and then they left. They were just there to make an appointment and she stayed through the long book to let her son read with me. I volunteered one afternoon when a family with six children came into the clinic for their well-child visits. The kids were all into having books read to them that even though I was only scheduled to read for one hour, I stayed for two until they were all done with their appointments. I just really enjoy seeing the smile on all of the children’s faces when I read to them. 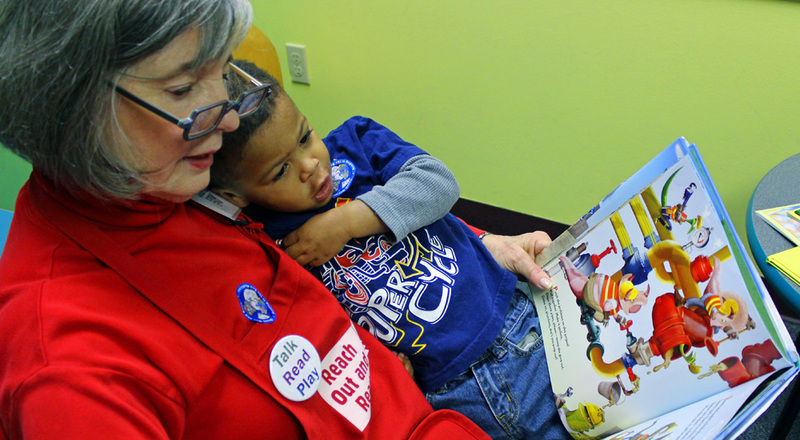 If this made you feel all warm and fuzzy inside, check out how YOU can become a volunteer with Reach Out and Read Kansas City today by clicking here. There’s no time like the present to give back to our wonderful community and change lives for the better. 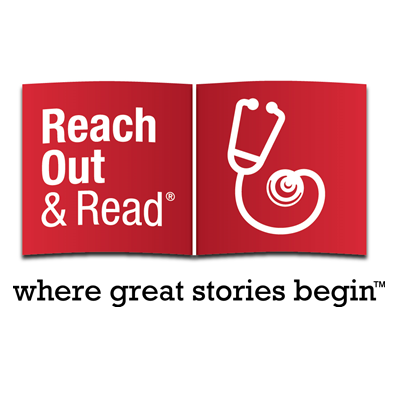 As the Marketing and Outreach Coordinator for Reach Out and Read, I have received the opportunity to do many great things with this organization. One experience that really stands out in my mind was when I was able to work with a local photography student to take pictures of our volunteer readers at different clinics throughout the area. As we made our rounds to each clinic, I explained to the parents why we were there and they graciously allowed us to take photos of their children. While the photographer snapped away, I received my first real opportunity to observe the volunteer reader program in action. By the time we got to our last clinic, Swope Health Central, the photographer as well as myself were getting a little tired. We experienced all sorts of kids, from older kids who were eager to read out loud, to younger kids who were shy and needed coaxing. We encountered a mix of excitement and nervousness as each volunteer reader took command of the room to read a story to the different children waiting to see the doctor. But we had one more clinic to go, so we put a smile on our faces and walked into the waiting room ready for anything. What we experienced exceeding all of my expectations, it came in the form of one of the cutest little boys I have ever seen. He probably was around two years old with big, brown eyes and a wide, sweet smile. When we walked in, he was sitting on the volunteer reader’s lap carefully listening to every word she said during her very animated version of the book Bang, Boom, Roar. Halfway through the story, the little boy’s grandma interjected that they needed to run outside to their car to grab something. When she told the little boy to come with her you could just see his face crumble as he began to cry. He reached his tiny hands up to the volunteer reader and held on tight as tears rolled down his face. The grandma looked surprised that he didn’t want to leave the readers side, so she asked if it was okay if she ran out to the car alone. Rocking the little boy, the volunteer reader said that was no problem and once again began reading the story, picking up right where she left off. Watching all these actions unfold before my very eyes somewhat astounded me. I knew that our volunteer reader program was a great way to get kids to listen to a story, but this was something completely different. The fact that our volunteer made such an impact on this little boy, enough of an impact to where he was visibly upset when he was told he had to leave, proves that something as small as sitting in a clinic waiting room and reading to a child for an hour out of a week, really can make a difference in their life. Because of our volunteer readers, kids are shown the importance of reading and how much fun it can be. This little boy absolutely loved being read to and you could tell by watching him interact with the reader. Each page she read, his smile spread wider and his laugh rang louder. In that moment he was exactly what he was supposed to be, a young boy enjoying a great story. Walking into Turner House Children’s Clinic I wasn’t quite sure what to expect. Was it going to be a mad house with kids running around the waiting room? Or was it going to be completely empty, not a young soul to be seen? As I made my way inside I let out a sigh of relief. Sitting in chairs throughout the giant waiting room were four families, and sitting at a small table in the middle of the room were two boys, talking and playing with different toys. I hurried to collect a bunch of books and the red Reach Out and Read apron, marched up to the table, set the books down, and excitedly exclaimed, “who wants to read a book?” At first the boys looked at me like I was crazy, but as soon as I spread the books out on the table they began to eagerly sift through them. The older boy looked around eight or nine, so I picked up a small chapter book and told him how cool it looked and that he should read it to me. A big smile formed on his face as he scooped up the book, opened the first page and began to read. The younger boy who looked to be about seven made his way over to us, and after a few minutes of listening to the older boy read each page, he announced that he also wanted to read. So there both boys sat, switching off line by line, if the younger one needed help the older boy would quickly assist him by sounding out the word. I must admit, it was an awesome sight to see. Not only were both boys reading but they were excited about what they were reading and willing to help each other out if they needed it. After a few minutes, their names got called to see the doctor, but before they left I made sure to tell them that they were awesome readers, high fiving them on their way out of the room. As soon as they left, a little girl who looked to be around five slowly made her way over to me. “Do you want to read a book,” I asked. It took her a minute to come sit down but after encouragement from her mom, she came and sat right next to me. I looked at all the books and asked her if she wanted to read one about Christmas. As soon as I said the word Christmas, a smile spread across her face and she nodded her head. I opened the book and began to read. It wasn’t long before the little girl started asking me all sorts of questions and pointing out the different illustrations. 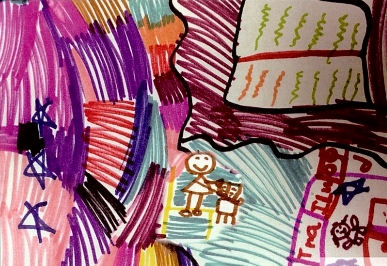 I learned so much about this little girl from her favorite color, red, to her favorite animal, dog. It’s like the minute we started reading the book her shyness evaporated into thin air. It’s crazy that one element on a single page of a book can do that to a child. Once we finished the book, I noticed the little girl’s mom observing us from her chair. I told her how sweet her daughter was and her response was ‘thank you for reading with her.” To many people a simple thank you might not seem like much, but to me it meant that the mom noticed her daughter come to life through something as simple as reading a book. Hopefully after watching our short time together, she too will read with her. After I said goodbye to the little girl I noticed there weren’t very many people left in the waiting room. As I looked around, I spotted another adorable little girl who couldn’t be more than three years old. What’s better was she already had a book in her hand. So I called over to her and asked if she wanted to read her book. She quickly got out of her chair and ran over to me. As I looked at the book I noticed that it was a Spanish and English book. I don’t know Spanish so I decided to read just the English parts. After reading one of the pages about colors, I asked her what her favorite color was. She said something back to me, and I realized she said it in Spanish. So I asked her a different question, and again she replied in Spanish. I continued to read the book, not knowing if she understood or not, but boy was she alert. She looked at each page, pointed to different things and said something that I could not understand. So in return, I smiled, nodded, and pointed to a different picture in the book that she would say something in Spanish about. We went on like this through the entire book. It didn’t even matter that there was a language barrier. This little girl was so into the book, smiling and laughing after she said something and nodding and smiling up at me, peering at me with her big brown eyes as I said something. This just proves that a book can do more than help children grow; it can allow two people from different backgrounds to come together and bond over one thing. By the time the little girl left, I realized it was already the end of the hour. My first time volunteering exceeded my expectations. I may not have learned any of the kids’ names, or spent more than twenty minutes with them, but I did get to see them smile and enjoy the books we read together. That is totally worth it to me.